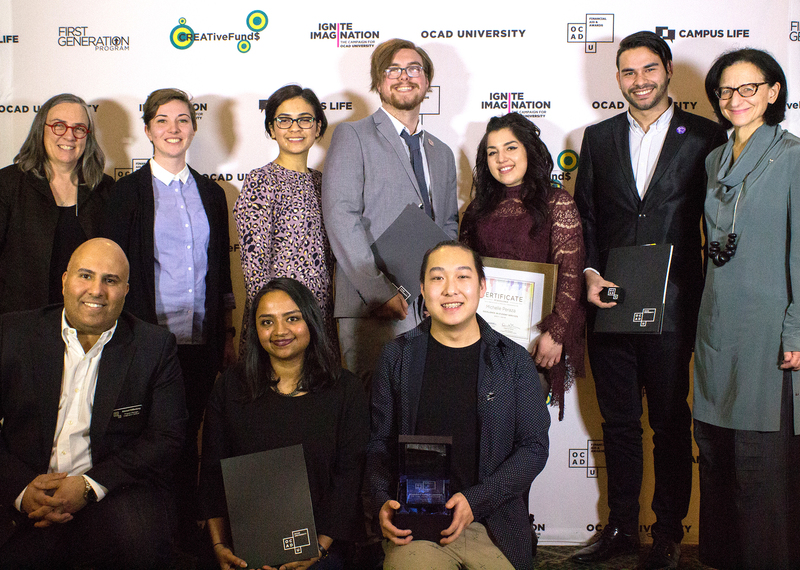 On Tuesday, March 12, OCAD University’s most outstanding student leaders for the academic year 2018/19 were celebrated at our annual Student Recognition awards dinner. Coordinated by OCAD U's Campus Life office and generously hosted in the Centre for Emerging Artists & Designers (CEAD) in their new space on the third floor of the Experiential Learning Centre in the Rosalie Sharp Pavilion, the dinner was catered by Pow Wow Café with Indigenous inspired cuisine. The dinner honoured the contributions of the university’s peer mentors, student groups and other student leaders for excellence in diversity and equity, as student employees, and Indigenous student leadership. Emceed by Campus Life international student monitor Monica Zhong, remarks were given by the President, Dr. Sara Diamond, representatives of the Student Union and Interim Vice-President, Academic & Provost Caroline Langill. OCAD U’s student representatives on governance bodies, peer mentors, peer wellness educators in the Health & Wellness Centre, student group leaders were all acknowledged for their great work. Peer mentors Danielle Coleman, Patricia Luk, Daniel Naraindasand Kenny Tranwere all recognized for serving three or more years with a special commitment pin. Additionally, awards selected through a nominations process were given out for several categories. Farah Basha and Sabid Ali of OCAD U’s Imagination Catalyst announced Ahmad as the recipient the Student Group Leader Award for his work leading OCAD U’s Muslim Student Association (MSA). This award is presented to a group leader who, through facilitation and involvement, demonstrates outstanding contributions, commitment and support to their group members and the OCAD University community. Ahmad was recognized for his strong leadership skills and dedication to the MSA, where he has demonstrated professionalism in coordinating regular meetings with best practices like using agendas contributed to by the team. He contributed to rewriting the MSA’s constitution, coordinated various fundraisers and potlucks, and Islamophobia and bystander intervention workshops, and is noted for his patience and willingness to work with others. The awards were supported and presented by David Thomas of OCAD U’s Alumni Association and Sandra Janzen, Director of Alumni Relations & Annual Giving. Salisa was recognized forher timely and effective communications, for being open to and encouraging, face-to-face meetings, for her genuine interest in getting to know mentees personally, for demonstrating knowledge and insight on curriculum, and for highlighting the benefits of community involvement as a resource leading to success. Roshan was recognized for his patient, inclusive approach, and the wealth of knowledge and insight he shared as a mentor. He was also recognized for his caring and encouraging nature, his initiative to help mentees navigate the university, its systems and programs, and off-campus community resources. This award acknowledges an outstanding student whose advocacy and leadership promote and advance human rights, equity and social justice. Nora was honoured for her work as a Peer Health Educator in OCAD U’s Health & Wellness Centre (HWC), where she has been involved in the Centre’s Cooking and Journaling Clubs. She has also contributed to OCAD Student Union’s Hot Lunch, where she promotes equitable access to nutritious meals, inclusive of gluten-free and vegan options. She has also held active roles with outreach events such as Willows for Wellness and the peer thesis Midnight Project. Nora consistently promotes inclusion and well-being, working towards equity and advocating for marginalized communities. Her work as a board member on the MSA included coordinating a campus workshop on Islamophobia and bystander intervention. She is dedicated to identifying barriers of inclusion and advocates for ways to make OCAD U programming more inclusive and welcoming for Muslim students and students with physical disabilities. The award was presented to Nora by Gino Marocco and Roshan Thiruchelvam of the Student Union, with Victoria Ho from OCAD U’s Office of Diversity, Equity & Sustainability Initiatives. This award, presented for the first time, recognizes an outstanding Indigenous student who has demonstrated exceptional leadership skills by actively participating in and contributing to the Indigenous student community at OCAD U. Melissa General and Connor Pion from OCAD U’s Indigenous Student Centre honoured Megan as the first recipient of this new award. Megan was honoured for their contributions as a core member of the Indigenous Students Association and deep involvement, commitment and engagement in Indigenous student event planning, community building and advocacy. Megan has contributed an immense amount of time, labour and love into the community at OCAD U, which is reflected in the many events, shows, student feasts and socials, both on and off of campus, that they have taken part in and/or organized. Megan has participated in, and/or co-organized and co-facilitated Indigenous student exhibitions (Primitive, 2016, Arrive, 2017, and Flux Refusal 2018) as well as student social events such as Creative Native Nights, Halloween parties and end of semester feasts. They have also worked as a Student Monitor at the Indigenous Student Centre, where they go above and beyond to assist with the daily upkeep of the centre, as well as supporting their peers. Amanda Amour-Lynx received an honourable mention for the Indigenous Student Leadership Award. Also new this year, this award acknowledges the considerable contributions made by OCAD U student employees (monitors) towards the operations of the university by recognizing student employee excellence, achievement, leadership and skills development. The first ever Student Employee Excellence Awards were presented to Setayesh Babaei (Fatemeh) and Danielle Coleman by Interim Vice-President, Academic & Provost Caroline Langill and Assistant Director of Human Resources, Connie Arezes-Reis. Setayesh has been employed as a student monitor in various areas (Admissions, Onsite Gallery, Student Union) where she demonstrated strong dedication, commitment, professionalism and high quality work. Her imaginative creativity and ease with collaboration across disciplines have contributed to the efficiency and effectiveness of OCAD U operations and services. Her positive and enthusiastic persona, demeanor, and high level of inclusivity and respect help create a safe, friendly and encouraging environment. She is noted as a tremendous role model who embodies OCAD U’s fundamental values and themes. Danielle is high-spirited, warm and dedicated. Approachable and knowledgeable, Danielle brings a strong sense of pride and leadership to her work and campus involvement. She has held an active position at Ignite Gallery for three years, mentoring and supporting other student monitors. She has provided support for the Drawing & Painting program Chair and student representative for Drawing & Painting Thesis. She speaks eloquently to the benefits of attending OCAD U. As Career Ambassador in the CEAD and peer mentor, she supports the success of her peers, makes connections, and supports the skill development of her classmates. Danielle’s positive attitude creates a safe space for diversity, wellness and cross-disciplinary collaboration. Honourable mentions for the Student Employee Award for 2018/19 are Christina Castellano, Michaela Coyoli Basman Monterrubio, Melissa Gaa, Sabrina Iacono and Nomi Juhasz. Finally, this new award recognizes the outstanding contributions of student leaders across the university in a variety of contexts, including (but not limited to) representing student perspectives in positions on OCAD U committees, working groups, task forces, governance bodies (such as the Senate or Board of Governors), or through publications, advocacy groups or the Student Union. President Diamond and Deanne Fisher, Vice-Provost, Students & International awarded the final awards of the evening to Nora Bahgat and Joel Lee. Nora was honoured for her work for her active roles as a Peer Health Educator in the HWC, the Student Union’s Hot Lunch program, her involvement in the Willows for Wellness event, her commitments as a board member for the Muslim Students Association, and her approaches to advocating for marginalized communities. Joel is noted for his deep belief in reciprocity and commitment to sharing knowledge, contributing towards his strengths as a student leader and community member. He is involved in variety of projects, programs and services on campus. As a student monitor, he is involved in a cross-disciplinary collaboration with Writing & Learning Centre, and Editor-in-Chief of NEST literary journal, a Writing Across the Curriculum initiative. He was also a Student Career Ambassador in the CEAD, where he was instrumental in providing a student’s perspective in the creation of new tools and resources for experiential learning projects and the new Work/Place program. His dedication to advancement and community galvanizes his peers to connect and take advantage of opportunities across campus and beyond. Honourable mentions for the Excellence in Student Leadership Award for 2018/19 are Khadija Aziz, Setayesh Babaei (Fatemeh), Uttara Ghodke and Roshan Thiruchelvam. OCAD U’s Campus Life office extends a sincere thank you to everyone who contributed to our selection committees: Connie Arezes-Reis, Farah Basha, Lynn D’Souza, Deanne Fisher, Melissa General, Alex Hong, Amanda Hotrum, Brent Everett James, Tori Maas, Nadia McLaren, Sarah Mulholland, Robyn Shaw, Roshan Thiruchelvam, B.h. Yael and Monica Zhong. The event would not be possible without the generous financial support of the Alumni Association, Alumni Relations, Financial Aid & Awards, the Indigenous Student Centre, the Centre for Emerging Artists & Designers, the OCAD Student Union, the Imagination Catalyst, and the offices of the President, the Vice-President, Academic & Provost, and the Vice-Provost, Students & International. Watch for the 2019/20 academic year student recognition nominations period to open in the new year 2020, and consider nominating a student you know for these important accolades. ​OCAD University's annual Student Recognition and Leadership Awards Dinner celebrates students excellence outside the classroom, and acknowledges their commitment to equity, advocacy, social justice, student life and fellowship. This year the Campus Life office is thrilled to let the community know that we have grown our portfolio of awards by creating three new opportunities to recognize students who have given so much of themselves to our community. In addition to our long-standing awards recognizing Peer Mentors, Student Group Leaders, and students committed to Diversity & Equity, this year we have added an Indigenous Student Leadership Award, an Excellence in Student Leadership Award, and a Student Employee Excellence Award. All of these awards rely on nominations from the community, so please take a few moments to consider nominating a peer that has influenced your experience at OCAD U. They could win not only this important recognition, but also a cash prize! The deadline to submit your nomination(s) is 11:59 p.m. Monday, February 25, 2019. Links to each nomination form are included below. This award recognizes an outstanding Indigenous student who has demonstrated exceptional leadership skills by actively participating in and contributing to the Indigenous student community at OCAD U, exemplifying a commitment to supporting its growth and development. This award aims to recognize the outstanding contributions of student leaders across the university in a variety of contexts, including but not limited to representing student perspectives in positions on OCAD U committees, working groups, task forces, governance bodies (such as the Senate or Board of Governors), or through publications, advocacy groups or the Student Union. This award acknowledges the considerable contributions made by OCAD U student employees (monitors) towards the operations of the university by recognizing student employee excellence, achievement, leadership and skills development. Peer Mentor Awards acknowledge those Peer Mentors who have made outstanding contributions supporting new and first-year students in helping them build their sense of community. The Diversity & Equity Excellence Award for Students acknowledges an outstanding student whose advocacy and leadership promote and advance human rights, equity and social justice on campus. The Student Group Leader Award is presented annually to a student group leader who excels, above and beyond in their leadership role by demonstrating outstanding contributions, commitment and support to their group members and the OCAD University community. You're invited to join staff from OCAD U Campus Life and OCAD U Health and Wellness Centre and (participating) student-run groups for hot chocolate, tea and treats, freebies and self-care tips. Connect with other students and join the conversation by sharing your ideas on how we can take better care of both ourselves and others, and help end the stigma of mental illness. Annually on the last Wednesday in January, Bell supports mental health initiatives by donating 5¢ for every applicable text, call, tweet, social media video view and use of the Facebook frame or Snapchat geofilter. Visit the Bell Let's Talk website for complete details on how to participate and how funds raised are used (https://letstalk.bell.ca/en/). As a mature student who is 25+, your experience will be different in many ways and you are not alone. This annual mature student-specific activity is a great opportunity for our new 25+ undergrads to mix, mingle and get acquainted with other peers. Connect with a few friendly faces before you hit the books, canvas, and/or laptops! OCAD U staff and current mature students are welcome to attend as welcome ambassadors. Refreshments will be served. *Currently on exhibit until September 29: Diagrams of Power showcases art and design works using data, diagrams, maps and visualizations as ways of challenging dominant narratives and supporting the resilience of marginalized communities. OCAD U student leaders were celebrated on March 22 for their outstanding extracurricular leadership contributions at Campus Life’s annual recognition and awards dinner. OCAD U student leaders were celebrated on March 22 for their outstanding extracurricular leadership contributions at Campus Life’s annual recognition and awards dinner. Emcee’d by Campus Life Student Monitor Daniel Naraindas, and included remarks from President and Vice Chancellor Dr. Sara Diamond and Vice-President, Academic & Provost Gillian Siddall. The Diversity & Equity Excellence Award for Students, supported by OCAD Student Union and Office of the Vice-Provost, Students & International, acknowledges an outstanding student whose advocacy and leadership, promoting and advancing human rights, equity and social justice. This year’s recipient, Meghana Ravi, co-led The Kaleidoscope Project, a multi-part arts-based participatory research project that included community consultations, an interactive public arts installation, and a full-length documentary that reflected the experiences and stories of OCAD U’s international student community. “Meghana is an exemplary student leader who uses her expertise in visual communication to engage in community building, education, and advocacy on issues of race and ethno-cultural identity, the international student experience, and decolonizing design,” said Sharmina Chherawala, Programs, Outreach & Human Rights Advisor in the Office of Diversity, Equity and Sustainability Initiatives. As an advocacy initiative, The Kaleidscope Project amplified the voices of equity-seeking communities on campus and situated all participants as experts and educators in sharing their critical analysis and lived experiences. “Meghana’s project helped build a stronger international student community on campus, and was highlighted in Now Magazine, showcasing how OCAD U community members are advancing decolonization in the curriculum and beyond. The highly anticipated documentary screening and panel discussions premiered to a packed house of students, faculty, staff, senior leadership and community members,” explained Chherawala. Peer Mentor Awards, supported by First Generation Programs, acknowledge Peer Mentors who have made outstanding contributions to the Student Mentor Program over the past program year. This year’s recipients, Daniel Lugo Travieso and Matt McCleery, have both demonstrated an inclusive approach in sharing their wealth of knowledge and insights. They have taken initiative to help other students navigate the university, it’s systems and programs and off-campus resources, and exercised patience when responding to questions. Their commitment to keeping in touch with their mentees, and to help students connect with each other and opportunities have helped build our student community. An honourary mention was given to Becky Wu. Special Commitment Pins were presented to Peer Mentors who have shown commitment to the Student Mentor Program. For the first time ever, a four-year pin was presented to Arashdeep Chahal, while three-year commitment pins were given to Elisabeth Chan, Jacqueline Lee and Adria Maynard. The Student Group Leader of the Year Award, made possible by Imagination Catalyst, is presented to a student leader of a group who excels, above and beyond in their leadership role. This year it was awarded to The Grind’s Russell Chiu. The Grind is an incubator for students who want to start their own small business, with goals to encourage networking and collaboration between students, provide workshops, guest speakers, and resources to assist in the development of new skills and portfolio building. Deanne Fisher, Vice-Provost, Students & International, acknowledged the commitment and leadership of OCAD Student Union executive and student participants in Board of Governors and OCAD U Senate. Andre De Freitas, Manager, Financial Aid & Awards, presented a special Excellence in Student Services Award to Michelle Pereza, who, since 2016, has served students with expertise, empathy, enthusiasm and excellence. “An extraordinary student services representative, Michelle’s skills and dedication have helped to break down financial barriers for her student peers,” said De Freitas. Special interest, student-run clubs and the six-year old Intramural Program at OCAD U allow interaction among students, support faith and culture, and create an atmosphere of diversity while encouraging self-development, entrepreneurship, social responsibility, environmental awareness, and fitness and well-being. Brent Everett James, Campus Life Coordinator, acknowledged student group leaders and intramural team captains for their leadership and contribution to community. Thank you to Financial Aid & Awards, First Generation Program, Office of the President, OCAD Student Union, Office of the Vice-Provost, Students & International, Imagination Catalyst and Campus Life for making this evening possible. You're invited to join OCAD U Health & Wellness, Campus Life, and student groups for #BellLetsTalk Day on January 31 from 11 a.m. to 2 p.m. in the lobby of 100 McCaul St for hot chocolate, tea and treats, freebies and self-care tips. Mental health affects us all. Join the conversation by sharing your ideas for how we can take better care of both ourselves and others, and help end the stigma of mental illness. On Bell Let’s Talk Day, Bell will support mental health initiatives by donating 5¢ for every applicable text, call, tweet, social media video view and use of the Facebook frame or Snapchat geofilter. For complete details on how to participate and how funds raised are used, visit the Bell Let's Talk website. Weekly meetings are held Thursdays in the Learning Zone! Vernacular is a creative writing and publishing collective dedicated to poetry and other experimental approaches to language. We meet to share prompts and new works, and to develop our language-based practices. Curated works will be distributed through periodic publications, podcasts and events. By fostering a community of writers, speakers and signers, Vernacular provides a platform for creative linguistic agency and innovation.